While I was looking through pictures from a street-style fashion blog, I came across a picture of a lovely lady wearing a pair of Western-style camel boots. I immediately realized that I had a similar pair and I also realized that I haven't worn them this year. This morning I felt al little bit better and we decided to go out for a late breakfast and do some errands in downtown. 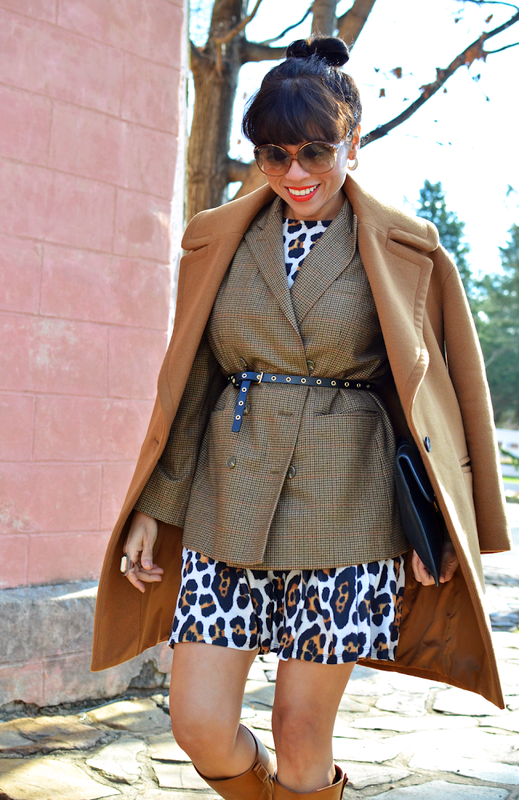 So, I put on my camel boots and paired them with my cotton leopard dress, which I layered with a plaid blazer and my camel coat. By the way, thanks so much for all your comments in my previous post, I really appreciate every single one. Mediante navegaba las fotos de un blog de estilo callejero, mire una chica muy adorable que llevaba unas botas de color camello. Inmediatamente me acordé que tenía un par parecido y que no me había puesto este año. Esta mañana me sentí un poco mejor y nos decidimos salir por un desayuno al centro de la ciudad y hacer mandados navideños. Me sentí con ánimos de arreglar me un poco y pues no perdí la oportunidad para ponerme mis botas. Mi look tiene como base un vestido leopardo, el cual le agregué unas capas para hacerlo mas adecuado a estas temperaturas. Espero que tengan un buen día y muchas gracias a todos por sus comentarios en mi entrada pasada. Boots/Botas: Gucci. Check this style by Sam Edelman. Que gusto que te sientas mejor! Y luciendo fabulosa, que bien que esas botas salieron a dar la vuelta porque son muy bonitas, me encantan con el leopardo, gran trabajo con el layering! Gracias guapa! Esos son los tesoros que una puede encontrar en su propio armario. I adore every outfit you create, you are a brilliant stylist! That coat makes me wish for winter, hope Zara in South Africa will have it next season! It's available online Nicolene. I don't have a Zara store near my city, so I have to take the chances and order online. Thanks for your sweet comment. Thanks Anisimeoku! I'm really enjoying these coats from Zara. These boots are so cool, they feel right for styling into your outfits. Glad you are feeling better, looks like a beautiful day. The picture by the rock wall is gorgeous! Thanks Ann! I'm still coughing my lunges off, but I needed to get back to my normal routine pronto.